Craven’s Bastion was built in the early 1700s and formed the northeast corner of the colonial “walled city” of Charleston. During the war with Spain in the 174os, scores of Spanish prisoners were housed here in miserable conditions. 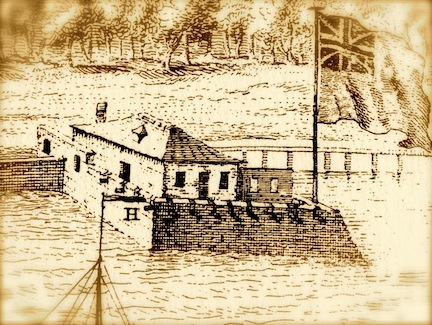 During the British occupation of the city in 1780–82, Craven’s Bastion was used as a civilian jail and headquarters of the “town police.” Like the rest of Charleston’s colonial fortifications, the bastion was demolished after the American Revolution, however, and the remnants of its brick walls are now hidden under East Bay Street and the steps of the U.S. Custom House (built 1853–79). Using clues from colonial-era documents and new archaeological technology, it might it be possible to pinpoint its precise location and dimensions. Please join Dr. Nic Butler for an illustrated overview of this important Charleston landmark. Wednesday, February 27, 2013 at 6:30 p.m.
For more information, contact Dr. Nic Butler 843-805-6968 or at butlern[at]ccpl.org.